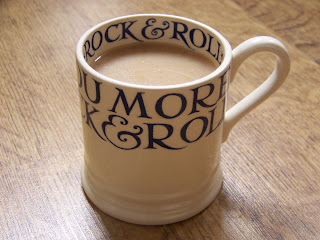 So I have a few loves in my life and this photo represents three of them, Tea, Rock and Roll and Richard. I bought this mug for him for Valentines day last year and I thought it was really romantic. I have had the whole music discussion with many people recently and it is amazing how important it is in relationships. Richard has one of the largest vinyl and cd collections I have ever seen. Although we have a few favourite bands in common we mostly like quite different genres. The most important thing is that we both love music though and I think unless you both love something the same amount it is very difficult to understand how much of your life can be taken up by that thing. If I didn't love music I think I would feel quite jealous of all the space it takes up in our flat and all the time it takes up in our lives. Oh and plus we both love tea so that is good too. Aww, this is lovely. You give me hope Laura! I think if someone bought me a cup like that, I'd love them forever and ever. Bless. Life would be so dull without music. It just fills the air with another breath of life. Love this! I was just about to post with a pic of our R&R mug - makes you happy everyday. Enjoy your tea!